TradeCoast Central has completed this purpose built and designed warehouse and distribution centre for Value Depot. The build started in July 2012 and with the Value Depot specific fit out requirements this job was completed in November 2012.Value Depot has officially moved into their brand new office and warehouse facility of 7,089 square metres at 44 A Amy Johnson Place TradeCoast Central. 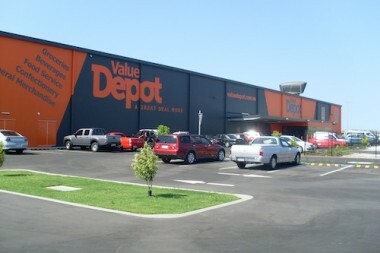 With the opening of Value Depot comes the opportunity to experience an exciting new wholesale megastore. ABN holders, whether shopping for their business or home, can purchase everything they need, from grocery to dairy or freezer,confectionery to food service, beverages through to a wide range of general merchandise, all at a terrific value for money prices. Value Depot is part of Metcash Food and Grocery, Australia’s marketing and distribution leader in food and other fast moving consumer goods. That, together with the fact they purchase stock in such large volume, gives them enormous buying power. Membership to Value Depot is free. Value Depot is exclusive to ABN holders and is not available to the general public. Members will be sent regular catalogues with great offers, so you’ll find the savings and benefits soon add up.